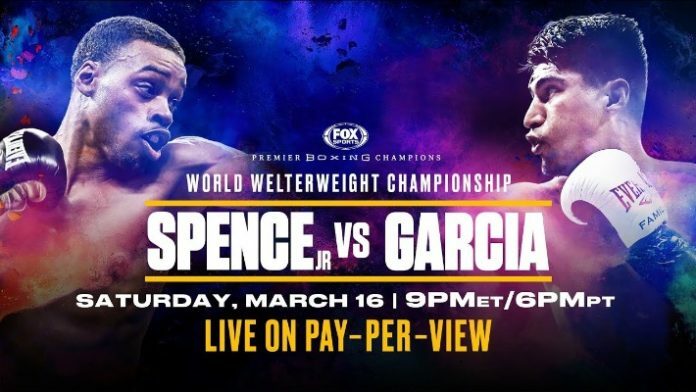 Check out MMA News' Spence Jr. vs. Garcia results, as Errol Spence Jr. takes on Mikey Garcia on FOX PPV for the IBF welterweight title. Tonight (Sat. March 16, 2019) Errol Spence Jr. defended his IBF welterweight championship against WBC lightweight champion Mikey Garcia. Garcia was jumping up from 135 pounds to 147 pounds in an attempt to hand Spence his first career loss. Spence is widely regarded as one of boxing’s pound-for-pound best. He brings incredible punching power to the table, as, of his then-24 career wins, 21 had come by way of knockout.